Your animals get in their upper, private areas by 2 ladders. They may also go back to the free run area in the lower floor by the ladders. The villa has all round large lattice windows and extra viewing windows into the private rest areas. The private areas are each accessible from the outside by a door. Removable drawers in the intermediate floor ensure a simple and better cleaning of the upper floors. The private rest areas may be locked from the outside by a slide bar. So you may prevent that the animals enter the free run area if required. The roof is provided with a special, waterproof coating (bitumen). The total length is 4.43 m (Element 1: 1.91 m + Element 2: 2.52 m – Dimensions roof edge/ outside). 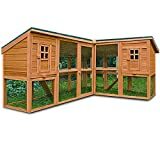 This entry was posted in Small Animals and tagged 2Tier, Area, Corner, Decker, FreeRun, GUINEA, HUTCH, Large, Play, RABBIT, Wooden by One Boutique. Bookmark the permalink.